"Everyone was efficient and polite." "Great experience. Comfortable and understanding of my problems." "I could not ask for a better experience." "Dr. Rowe is always very informative and answers my questions or concerns completely." "Love the DocSpa and the staff!!" "The doctor treats you like family. Very warm and sincere." "There's a reason they're voted #1 in Albuquerque." "Love the doctors and the staff. They are always so great with the kids." "The doctor is excellent as always!" "Love the Doc Spa. All the doctors and staff are amazing! I wouldn't go anywhere else." "I am always made to feel important. Thank you to the staff!" 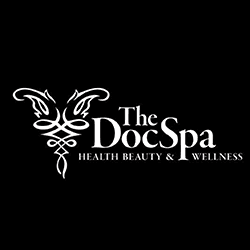 The Doc Spa is Albuquerque, New Mexico’s state-of-the-art integrated medical spa. Four board-certified doctors raise the standard for whole-body healthcare by providing comprehensive services through a three-pronged health, wellness, and beauty approach. Led by the co-founder Dr. Julian Rowe, MD, MPH, FACOG, The Doc Spa serves men, women, and children in Albuquerque and Edgewood, New Mexico, with a full menu of integrated services to diagnose and treat the root causes of your symptoms. The providers at both clinics are dedicated to treating you using their conventional training in conjunction with functional, alternative, holistic, and complementary treatments. Whether you’re looking for answers to a chronic condition, support during your pregnancy, or need to schedule a well-child visit, The Doc Spa helps your whole family achieve maximum health and wellness. Blending our education and experience with the latest medical technology, we are proud to provide comprehensive women’s OBGYN care and pediatric care that integrates routine medicine with beauty, wellness and alternative medical treatments. We provide routine and high-risk pregnancy care as well as primary care. You can receive the attentive treatment that you need from the best-trained physicians in New Mexico. We are taking new patients to provide primary care. Our physicians are compassionate and have the knowledge and experience to work with patients of all ages. We make it a priority to get to know you so that we can offer the best quality care. No patient is too young for the pampering care provided by The Doc Spa. We offer routine pediatric care, including well-child exams, preventative health care and immunizations. We provide exceptional integrative health care for men, women and children. Every aspect of your well-being is vitally important to us, so we help you select the health care treatments you need and ensure your comfort in the process. The massage therapists at The Doc Spa put your mind and body at ease by manipulating the soft tissues of the body to aid the body in healing itself and increase your health and wellbeing. Our massage therapists provide cranial-sacral therapy, lymphatic massage, polarity therapy, reflexology, Swedish massage, sports massage, trigger point therapy, shiatsu and hot stone massage therapy. ONDAMED uses electromagnetic energy to stimulate your body’s natural healing process. Using a neck and hand-held applicator, ONDAMED produces a highly-focused pulsed electromagnetic field that penetrates deep into the targeted region to jump-start cellular activities. Dr. Lui performs ONDAMED on those who are seeking pain relief, relaxation, improved sleep and improved circulation. Power Balance is a holographic bracelet that is embedded with 35 specific frequencies that react positively with your body’s natural energy field to improve balance, strength and flexibility. Power balance is for athletes as well as to prevent falls and injury by the elderly, children with developmental problems and patients with chronic back pain. Arctic Ease® uses cryotherapy (cold therapy) to reduce inflammation, bruising and pain caused by injury. Arctic Ease® is a special type of ice pack that reduces the firing of inflamed nerves and swelling to decrease painful muscle spasms. The packs stay comfortable cool for hours and are completely reusable. The Doc Spa has many fitness advisors available to provide you with sound advice on what type of exercise is best for your body and your goals. We work with local personal trainers to promote an integrative approach toward reaching your optimal level of fitness. Not all herbs and supplements are created equal. The Doc Spa provides nutritional and supplementation counseling to answer your questions. Our doctors will evaluate your medical history and lifestyle habits, resulting in a personalized prescription of which vitamin and herbal supplements are right for you and your specific health goals. Menopause is an important transition that brings physical and emotional changes to every woman’s life. Dr. Julian Rowe provides a multi-faceted approach to peri-menopause and menopausal care, recommending lifestyle changes, exercise, supplements, hormone replacement and hormone balancing depending on your personal needs. Combining contemporary medicine with Traditional Chinese Medicine (TCM) allows Dr. Lui to bring you the best of both worlds through acupuncture, cupping, herbal treatments and Western medicine. Having been utilized for over 5000 years, TCM is an integrated system that provides benefits stand-alone Western medicine can’t provide. "I see Deborah Rivera for primary care. I believe she truly cares about her patients and wants to do what is best for them." "Great acupuncture and cosmetic services. Careful patient attention and good doctors." "All the staff were courteous. I was seen by my appointment time. It was my first visit to The DocSpa and it was a very positive one." "I moved here about three months ago and met with Dr. Lui and Dr. Rowe. They are both very nice and very knowledgeable about what they do." "Everyone is always very nice and helpful. That meant a lot to me. The office is very nice and always clean. I won't go anywhere else." "I have been going to Dr. Rowe for 20 years. He really is the best and the staff is wonderful!" "Dr. Rowe is nothing short of amazing. His bedside manner is phenomenal and his surgical skills are precise. Thank you Dr. Rowe and the DocSpa staff!" "I have had nothing but the best care at The Doc Spa. Office staff is amazing very nice and they take time to answer your questions as well." "I have been extremely pleased with my experiences at The DocSpa. I tend to be very self-conscious but I immediately felt comfortable with Dr. Rowe." "This is an amazing facility. The services are very reasonably priced and the doctor's are knowledgeable. They have worked with me and I appreciate all there help." "Dr Lui is so sweet and funny and she is in no rush. She knows kiddos by name not by chart! My son is always so bubbly around her!" "Best doctor ever!! Dr. Rowe delivered/cared for both my niece and all five of our kids; Marcus, Apollo, Noah, Benjamin and Lilliana!" "It is one of the only places I know where the doctors actually do the treatments instead of the technicians. I feel like they want to build a relationship."